Simple to prepare and delicious to eat, I make this when I want a quick whole-grain side dish to pair with grilled fish or roasted chicken. Leftovers are good cold, with a squeeze of lemon. Heat the olive oil in a large sauce pan over medium heat. Add the onion, carrot, and celery, and sauté for a couple of minutes, until just tender. Add the garlic, bay leaf, and bulgur, and stir-fry about a minute, until the bulgur is coated with oil and begins to stick to the pan. Turn down the heat to the lowest setting, then add the boiling water to the pan. Stir to combine, then cover the pan and let sit for 15 minutes, checking halfway through (if there's still water in the pan, turn the heat up slightly, but if there isn't any water left, turn off the heat). 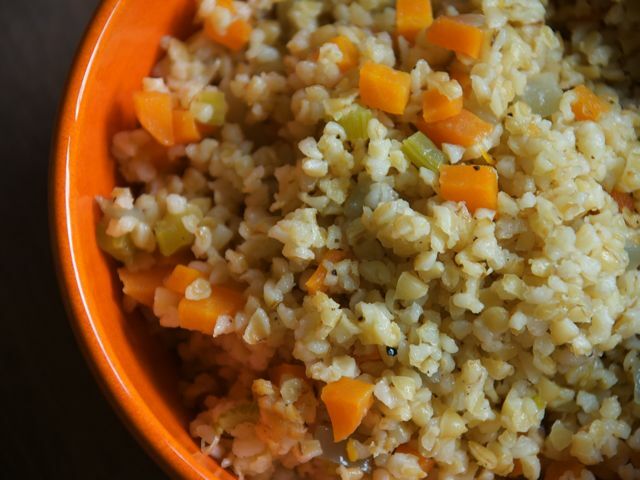 The pilaf is done when the bulgur has absorbed the water and the grains are tender. Season to taste with salt and pepper.